A while back I did a post on the Mil-W-46374B military wrist watch that was used by "ground pounders" in the US military during Vietnam and the decade following. Hamilton was one of a handful of manufacturers that made Mil-W-46374 watches in a series of versions (B, C, D, etc). As I said in that post, there was also a similar model called the GG-W-113 that was used by aviators. Although the GG-W-113 looks almost identical to the Mil-W-46374, it contained a higher quality movement inside with a "hack" feature where the watch stopped when the time was set. 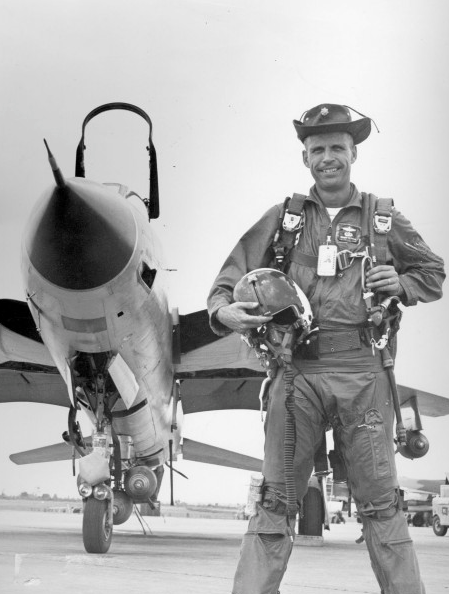 In the shot below, Lt Col Bob Krone of the US Air Force stands in front of his F-105 Thunderchief. Is he wearing a GG-W-113? No, probably not, as this photo was from 1966. However, it reminds me of a joke... "What kind of watch would a man as tough as a Vietnam fighter pilot wear?" Any darned watch he wanted. Thank you for your service Col Krone. Here's to you and those like you. Anywho - the military watches like the GG-W-113 are fairly sought after. They were even emulated by civilian models in Hamiltons line up like the L.L. Bean Field Watch and early Khaki series. Unfortunately you will also see a lot of fakes out there so you have to be very careful if you're buying one. I don't know a lot about GG-W-113's, to be honest. I do know that they came with two possible movements, depending on era. You should see inside either an 17 jewel 649 movement or a 685 movement. Two mfg part numbers could be stamped on the case back, 92230 or 39986. The case backs are also dated with a year of manufacturing and I've observed that the 92230 was used in the early 1970's and transitioned to 39986 towards the end of the '70s and used into the 80's. Furthermore, I've read that 39986 may refer to the 649 movement and 92230 to the 685 movement... but I'm not sure about that. I'll mention some other observations below. There are so many fakes out there that my interest in this genre of Hamilton military watches is pretty low. However, a fellow collector friend of mine was having trouble with his GG-W-113 so I agreed to take it on. It was not working and the crown / stem was not connected. Upon receipt, I was a little suspicious. The GG-W-113 had fixed bars for a one-piece strap, at least in the 1970's, so the two part strap could only be installed if the fixed bars were removed or if the watch was a fake. I can see by the angle of the crown that it's not connected to the movement... that, or it's irreparably damaged. The markings on the case back look legit to me. They're not uneven, sloppy or otherwise suspicious looking. The 99230 is a 1970's number. If this was a 1979 watch or a 1980's model, I would expect 39986. The buggered up lugs look to me like someone drilled out the fixed spring bars. The holes are way bigger than necessary, in my opinion, and actually limit what you could use to secure a strap. Big, fat spring bars are required now. That's actually a good sign that this is a legitimate model though - as a fake watch probably wouldn't have big ol' holes like this. This female stem is damaged somehow, splayed too far outward to hold the male-side of the stem. Looks to my eye that the stem is a larger tap than I would expect... maybe an 8 or even a 6. The best I could do to replace the stem is to replace the crown with one with a smaller tap 10 stem. This is a 649 movement... that calls into the question if 649's were used solely in 39986 watches. It's definitely in at least one 92230 watch. The movement is filthy - so that's a good sign that it's legitimate too... or at least a really old fake. The dial feet on a 649 are held in place with spring clips. You can see one has been swung outward, freeing the foot to allow the dial to be lifted off. Looking at the dial-side of the main plate, you can tell (well I can, anyway) that this is an ETA movement. With the barrel bridge out of the way, you can see the little golden clip used to stop the watch (hack) when the stem is pulled out to set the time. Also, notice that the main plate is jeweled at the barrel arbor. That's one of the 17 jewels inside the watch. With the balance out of the way, just the pallet fork has to come out now in order for the main plate to be cleared of parts. In this shot you can see that the 649 is based on an ETA 2750 movement. Here's the inside of the case back - clearly this is a legitimate Hamilton watch case. Everything gets thoroughly cleaned in the ultrasonic. This watch spent almost 30 minutes in the cleaner and two rinse cycles. The 649 has a 21,600 BPH beat rate, which is visibly faster than the 18,000 BPH rate that most vintage watches utilized. If I saw this fast a motion on a pre-1969 watch I would be really worried. The timer tells me there's something not right inside. Something is making extra noise. It doesn't take much to make noise like this. Re-cleaning the hairspring and/or running the watch through a demagnetizer normally clears it up. Phew! It took a while but I finally got it dialed in. Good amplitude, low beat error, running just a smidgen fast... just the way I like to see them after an overhaul. I repainted the second hand white. I don't think the red paint on the tip was original but I left it anyway. I believe it actually should have luminous paint on it. The replacement crown is a decent match but not perfect. It'll have to do until my friend can find a stem to fit the original crown. At least the watch looks and runs like it should now - so I'm sure he'll be happy with it. Not a bad fix! I have one of the LL Bean versions from the 80's. The second hand is lumed from the center to the tip, but not on the short end (just like the current Hamilton Khaki officer mechanical). Yeah, I think the specs call for lume in certain places (like the second hand) so that's a good way to spot a fake. Of course a lot can happen to an authentic watch over 40 years, like getting a red tipped second hand. I think anytime these watches are found for sale there's a big fat caveat emptor involved. Depending on the crown that on there, you need to order the female threaded stem in the appropriate tap size. Sometimes its tap 10 and sometimes 8. Your best bet is to contact a watchmaker so you get the correct part. Hi, I have a British army Hamilton 649 but the male part of the split stem is missing and I'm having trouble finding one! Can anyone help please! I might have been wise to read this first. I just won a bid on a 1976 Hamilton. The back is stamped but it has the notches for a screw on.